BOUNCY CASTLES AND trampolines caused hundreds of injuries last summer, some resulting in breaks and sprains. The injuries happened to children as young as 32 months right up to adults aged 53. Vhi SwiftCare Clinics treated over 200 patients with such injuries last summer and it has already seen over 20 ‘bounce’ related injuries this month. Most of the injuries last year happened to those aged 11 to 21 (57%) while those under 10 accounted for 38% of the injuries. 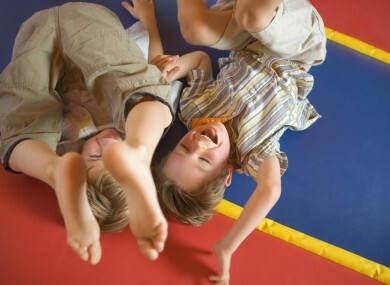 Last May alone, the private clinics treated 63 “bounce” related breaks and sprains, 60% occurred during trampolining and 40% happened on a bouncy castle. Girls were slightly more likely to injure themselves than boys (54% vs 46%) and over two-thirds of the bad bounces resulted in a break rather than a sprain (69% vs 31%). Overall, lower limbs such as legs, ankles and feet were much more likely to be injured. Medical Director of Vhi SwiftCare Clinics, Dr Brian Gaffney, said, “May is typically when we start to see injuries of this kind and in fact in the first two weeks of the month, we have treated approximately 23 bounce-related injuries. While the weather tends to be warmer in May, it can also be showery which can make trampolines and bouncy castles particularly slippy and dangerous. “If it has been raining, make sure that surfaces are dried off thoroughly – bouncing on slippery surfaces is a recipe for disaster. Dr Gaffney added that, “Prevention is better than cure – always have a responsible adult supervising this type of activity as most accidents take place in that split second when backs are turned and attention is elsewhere. He also added that adults should not try out their bouncing skills after consuming alcohol. Email “Over 200 'bounce injuries' last summer with patients aged from two to 53”. Feedback on “Over 200 'bounce injuries' last summer with patients aged from two to 53”.